Phuket is the largest island in Thailand, located in the Andaman Sea to the west of the Malay Peninsula . The island is very mountainous , especially in the west, with a mountain range aligned north to south . These mountains are the southern end of a chain that extends over 440 km in the Isthmus of Kra and culminates at 1138 m Khao Phra Mi The highest elevation on the island itself is while 529 m above sea level , in May Tha Sip Song . Nearly 70% of the island is covered by forest . The western coast has several sandy beaches , while on the east coast they are muddy . The extreme south of the island is Laem Promthep , very popular point of view for its sunsets. The main tourist area of the island is Patong Beach , which also has most of its nightlife and is the center of cheap shopping on the island. Other popular beaches include those of Karon, Kata , Nai Harn Beach and Bang Tao. >The beaches of the south coast are typically crowded, while the north is far more tranquil. 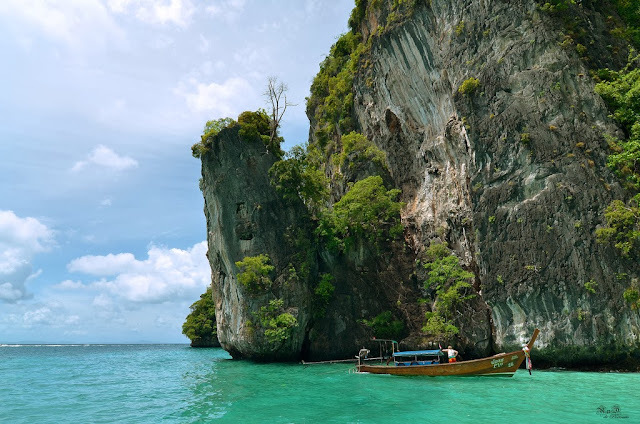 >All the major beaches (such as Patong beach, Kata beach, Karon beach, Nai Han beach, Mai Khao beach , Nai Yang beach) offer instruction and equipment for diving, snorkling, wind surfing and sailing. Don't forget to notice red flag! before swim.